Our large format Epson ink-jet printer offers stunning quality, on a variety of papers in any size up to 600mm wide and 2m long. 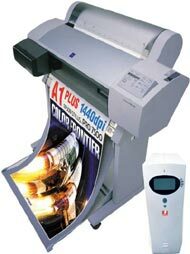 We use UV inks to give the most vibrant colour which are guaranteed not to fade in direct light or under spotlights. Our finishing service includes cutting your print to any size, dry-mounting onto foam or plastic board or adding adhesive to the back. See our artwork guide for supplying your own files.